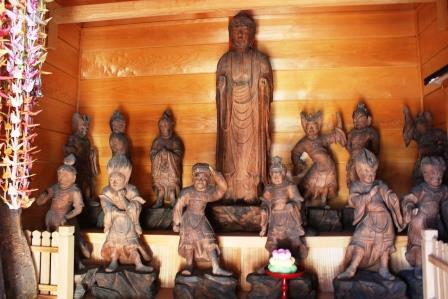 These are the mokuzouyakushinyoraizo and jyunishinshouritsudzo statues that were created in the Muromachi period, which were placed at Enryu-ji temple in Irimada, Shibata-machi. The original had been enshrined in Yakushi-do, Nichiren temple that was on the mountain behind the temple but it was moved to Enryu-ji temple in 1908. Yakushinyoraizo and jyunishinshouritsudzo have both been carved using the Katsura tree. Yakushinyoraizo is also called the Medicine Buddha is referred to as "Tohorurikonyorai", and for the people of Miyagi who live with the large Pacific Ocean to the east, this Buddha was a familiar Buddha with the power to ward off the sickness or disaster to the east. The Twelve Heavenly Generals becomes the alter ego of Yakushi, and because they protect the 12 hours and direction, it emphasizes the dynamic posture and facial expression of dignity and rage. They were both registered in Miyagi Prefecture as designated cultural property in March 9, 1956. This is the Zen temple of the Soto sect founded in the 2nd year of Bunroku period (1593), and is famous for being the family temple for Kai Harada who was famous for the Date Disturbance. When Munesuke Harada or Kai Harada as he was called became the owner of the Funaoka castle and moved here, there were two groups in Irimada who resisted the new lord. At the Maruyama Castle everyone down to the last soldier resisted and the castle owner committed seppuku and the whole clan, down to the last follower and child were all cut down. The Harada family, feeling sadness and pity on the severity of the execution, even though they were enemies, called their family temple's 9th priest at Funaoka Toyo-ji temple to the area and gave a memorial service for the Muruyama Casle's souls. This was how this temple came to be. Enryu-ji temple, as the Harada family as the founding family, was a magnificent building not seen anywhere else in the vicinity (destroyed by fire in 1903). At the Date Disturbance in 1681 Kai Harada was cut down, the family temple of Toyo-ji temple was moved to the current Tome City, and from that time, the name of Munesuke Harada who founded Enryu-ji temple disappeared.